© Copyright Glenn H. Mitchell 2010-2018 All rights reserved. A doomed killer’s cryptic warning, an ancient Japanese book on the occult, a family of Italian witches, a mannequin that can’t be destroyed, the murderous spirit of a dead child. 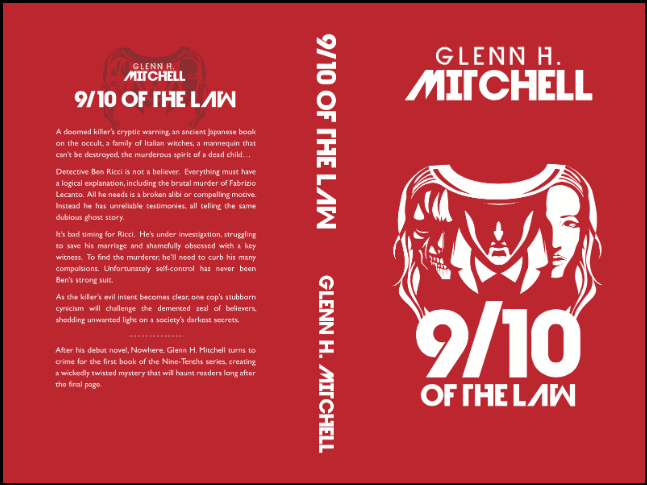 With Nine-Tenths of the Law, Glenn H Mitchell turns to crime, creating a wickedly twisted mystery that will haunt readers long after the final page. Detective Ben Ricci is not a believer. Everything must have a logical explanation, including the brutal murder of Fabrizio Lecanto. All he needs is a broken alibi or compelling motive. Instead he has unreliable testimonies, all telling the same dubious ghost story. It’s bad timing for Ricci. He’s under investigation, struggling to save his marriage and shamefully obsessed with a key witness. To find the killer, he’ll need to control his many compulsions. Unfortunately self-control has never been Ben’s strong suit. As the killer’s evil intent becomes clear, one cop’s stubborn cynicism will challenge the demented zeal of believers, shedding unwanted light on a society’s darkest secrets.